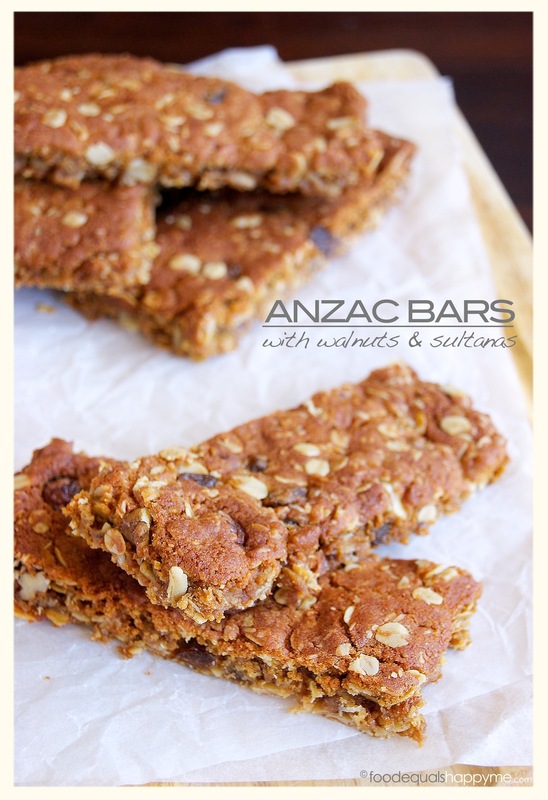 So what do you get when you cross an Anzac biscuit with a muesli bar, an Anzac Bar of course! 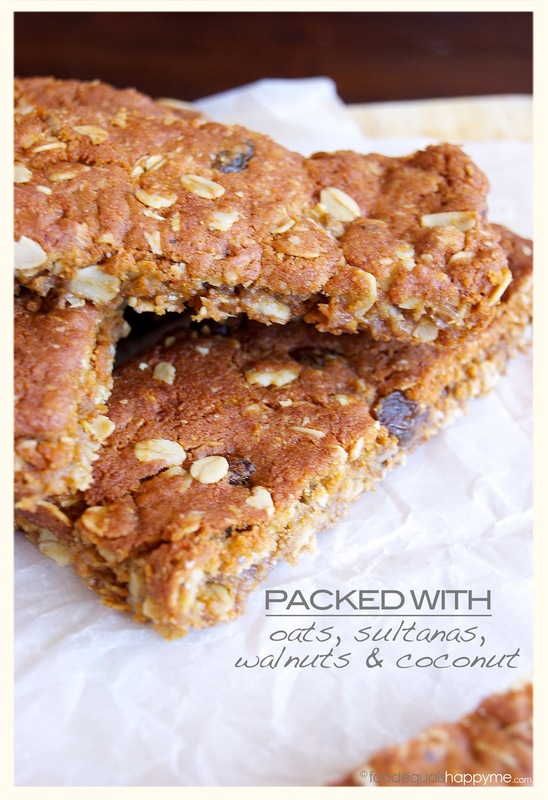 Traditional Anzac biscuit flavours of oats, coconut and golden syrup, bulked up with the addition of sultanas and walnuts makes a mighty fine Anzac slash muesli bar in my opinion. 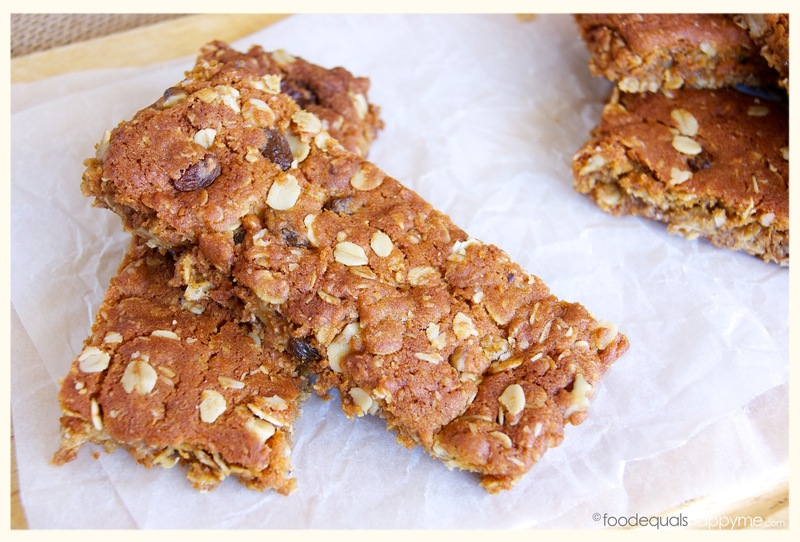 These bars are more chewy than crunchy (just like my favourite kind of Anzac Biscuits) and they have that traditional slightly caramel toasty like anzac biscuit flavour. This is most definitely not a strict recipe that you have to follow by the letter, you can change it out for any dried fruit and nuts that you prefer, maybe even cranberries and almonds? the possibilities are only limited by your imagination, or the ingredients in your pantry. Perfect for school lunchboxes or afternoon treats, they keep well in an airtight container as well. Pre-heat the oven to 150 degrees celcius. Put the oats, flour, sugar, coconut, fruit & nuts in bowl and mix to combine. In a saucepan on a low heat melt the butter and golden syrup. Mix the bi-carb soda with the hot water, and then add to the melted butter mixture (it will froth up). Add the wet mixture to the dry ingredients and mix to combine. Press the mixture into an even layer on a baking sheet and bake for 30-35mins or until cooked through (it will look overly gooey in the middle if not cooked through properly). 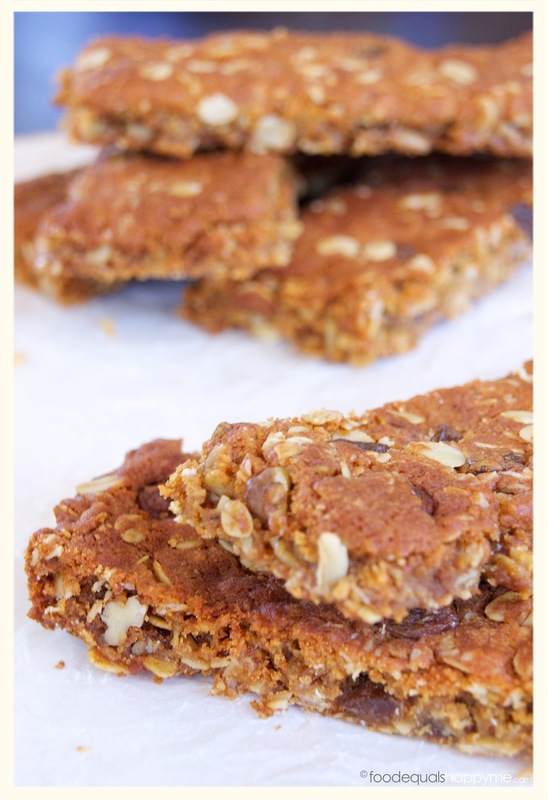 Leave to cool slightly on the tray before cutting the layer into bars (if you do this whilst the mixture is warm it will be easy to cut) then transfer the bars to a wire rack to cool completely. These are great and they freeze well when made in bulk.